The future of education in the field of film and television is going to be extremely interesting. I've been teaching film editing for a few years now and one thing that is constantly a problem is time. For example, in the class I am about to begin teaching Monday, I have a total of 42 hours to teach everything I can about post. 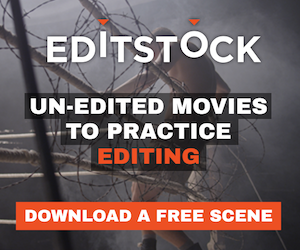 Not just editing, not just sound, not just FX but everything! This includes technology, techniques and theories. 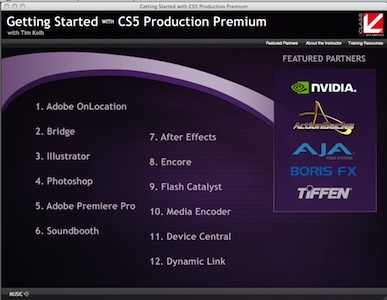 This is where my review for Class on Demand’s "Getting Started with CS5, Production Premium" begins. As an instructor at a local university, I’m expected to cram as much knowledge into the heads of my students before sending them off into the world to fend for themselves. This DVD is possibly a tool I can utilize when helping my students become fluent in software such as Adobe CS5. 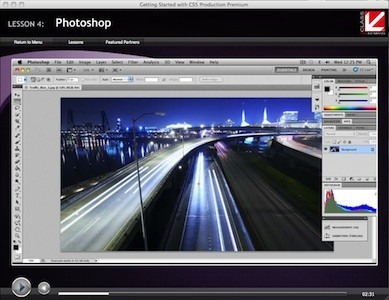 In my last class, I had the students learn Final Cut Pro, Adobe CS5 and Avid. All in one course. To make this work, I had to let the students read up on the software from pre-approved books. This isn’t the most effective approach, as students with problems are left to email me or message me on the internal class website. Since teaching is only a part time endeavor I focus my days on editing. This usually means I don’t get access to my emails until later, most students have left the project aside or forget the exact problems they were having. Had I used this DVD and others in the Class on Demand series, I could have requested that students watch the videos as part of their homework, then apply this knowledge during class, having the students cut scenes, applying their learned knowledge of both technology, techniques and the theories I’ve taught them. I am sure that this raises the question in most readers, what about the quality of the video lessons? I can put your worries to rest. 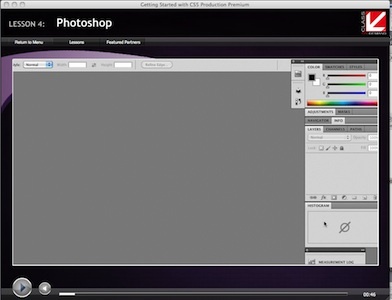 Tim Kolb is extremely knowledgeable in the topic of Adobe CS5, in fact, I learned to use tools I haven’t needed to use in my current work, which prepares me should I need to use them in the future. It also comes with bonus lessons on technology from their sponsors such as Nvidia, AJA, Actionbacks, BorisFX Tiffen. The video is a direct screen shot of Kolb’s desktop, so if you are like me and have two monitors for editing, this is fantastic. I can place the video full screen on one monitor, while following the instructions on my other monitor. I also really appreciated that Class on Demand supplied the raw footage from their examples on the DVD so that you can use it to follow along. In software like Premiere Pro this was not a huge problem for someone like myself who has footage lying around, however, when doing the photoshop tutorial this was great. I can double check that my image looks like Kolb’s. This definitely puts the Class on Demand DVD ahead of their Youtube counterparts. Having everything you need all on one DVD, footage, photos and more makes life easier for the beginner who has never touched the software before and isn’t simply switching from another software. I do have to make a point of discussing one issue I had with the product. Initially, when I received the DVD I was over the moon, great knowledge, all on a single DVD, with footage! I wondered, why not online? So I went to Classondemand.net and found the sales section for the DVD. They do have a downloadable version, but this is where my jaw dropped. The DVD was priced at $149.95 USD as was the download. The cost in my mind is prohibitive, I would not purchase a tutorial at that cost, especially a downloadable version. Surely the company could lower the price of the download, they have no printing costs. As an instructor I have to find the most reasonable priced product for my students. Many of whom have to rely on grants and government support to afford an already expensive program. When students want to learn outside the class I usually recommend lynda.com, whose premium plan costs $37.50 USD a month for all their courses and videos and comes with the lesson plan files. Here’s what it comes down to, Tim Kolb is extremely knowledgeable, you can’t go wrong learning from him. His DVD is cheaper than a weekend workshop and you get to keep it. However, if you are price conscious you may want to go elsewhere. I really hope Class on Demand decides to look into giving month to month subscriptions and the more interactive online experience that their material deserves! This episode we have our OSCAR special, with Woody Richman and Tyler walk, the editors of the Academy Award Nominated film How To Survive a Plague. Put together by Enriched Books and Art of the Guillotine, here's the history of Editing Technology. Around 2010, while preparing for a 31-city tour with Clay Blackmore and my business partner Jeff Medford, I discovered Tiffen Dfx post-production filters. To be honest, at first impression, I wasn't drawn to this system — I was pretty obsessed with Apple's Color, and doing color correction right inside Adobe Premiere. There are many infographics out there, but none for film editors. So I teamed up with Nina from Nina's EDL and created one. Enjoy! As part of our month long August give away, we have an interview with Niclas Bahn from Noise Industries, who donated FxFactory Pro for us to give to members of our community. We talked via email about their products and goals for future products. If you are wanting to chat with some of the top film editors in the world there will be a Post Chat tonight via Twitter. I was on a site that was showing google map markings of film locations and they were missing Battleship Potemkin. So I searched for Odessa Steps and here's what I found. Requested by a user, I was asked to come up with some information for working with composers. Ken Sallows, A.S.E., the great Australian film editor, sent the original opening to In the Blink of an Eye. Here's the story behind it and the pdf. So, you’ve viewed The Arcade Fire video directed by Chris Milk and edited, yes edited, by Livio Sanchez. When I first viewed this music video my mouth fell to the floor, when I viewed it again I couldn’t help but think about Ronald Bergan’s biography about Sergei Eisenstein titled: Eisenstein: A Life in Conflict. In this book there is a brief an idea Eisenstein had about how viewers should view the screen.